What would a world without Scripture look like? This is just one of the questions Bryan Litfin poses in his Cheveis trilogy. I’ve recently read the third and final installment—after a year-long wait (! )—and enjoyed every minute of the time I’ve spent with Teo and Ana, following their adventures throughout Cheveis and the great Beyond. The first book, The Sword, sets the scene and poses the question of what would happen if the Word of God was lost forever. The second book, The Gift, follows Teo and Ana on some amazing adventures as they get to know what is in the great Book and as they encounter those who do not want the Word of God to be made known. 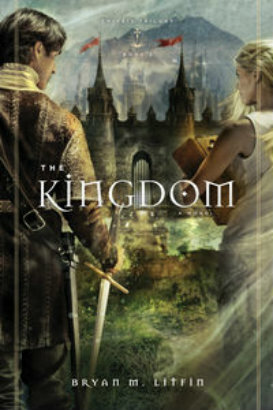 The final book, The Kingdom, continues the journey as Teo and Ana are called to spread the Word to the far reaches of the Beyond. But they encounter severe spiritual opposition, even from some who claim to be followers of Deus (their word for God). Several exciting battle scenes later, Teo and Ana are poised to finally return home to the land that they love, but they must still fight for their love (yes, there is a love story woven throughout all three books). I love how Bryan Litfin weaves deep theological questions with the genre of fantasy and romance. I love how he brings these characters to life and makes me want to know more about them. I love his descriptions of battle scenes and beautiful settings of places I know he has visited many times in Europe. Of course, there may have been a scene or two that seemed a little contrived, particularly the love scenes between Teo and Ana. This could be, though, because I know Bryan from church (seriously, Bryan, how DO you write this stuff?!). Also, his use of modern phrases mixed with a fictional language with a medieval bent occasionally bothered this English teacher. But overall the books, all three, were so enjoyable I didn’t want them to end. So back to my question: What would a world without Scripture look like? Even though it seems, even today, like the Word of God could die out forever, it will not. Never. God is still in His Heaven. He is still working out His plan for His creation. And He will never let His word be lost. This is Bryan Litfin’s theme, and it has challenged me to take God’s Word more seriously and to treat it as the precious gift that it is. I’d say that’s a pretty good takeaway. I always liked "book reports" and this was a great one. Loved the Amos passage ... wow.